LASIK offers many improvements over other refractive surgery procedures. These include little or no post-operative discomfort, immediate vision improvement, and the ability to drive or return to work quickly-sometimes as soon as the next day. Most patients require no corrective eyewear after surgery (although patients over 45 most often need reading glasses). Call today to schedule your consultation and find out if you are a candidate for LASIK. Soon you could be tossing away your glasses or contact lenses and enjoying the freedom of clear vision. The Visian ICL™ by STAAR Surgical is an insertable contact lens used to correct myopia (nearsightedness) without altering the cornea. Patients who undergo this procedure can often have sharper, clearer and more vivid vision correction than LASIK, a quality termed High Definition Visian™ for its significant results. The Visian ICL™ can treat much higher amounts of nearsightedness than LASIK surgery and be useful in patients who may not be good candidates for LASIK surgery. Dr. Benedict was the first doctor in Cobb County to implant the Visian ICL™ for patients. Made of Collamer®, a highly biocompatible material with small amounts of purified collagen within, the Visian lens safely improves vision while protecting the eye from ultraviolet rays. This lens does not require any special care and stays in place on its own, just like your natural lens. There is minimal risk of injection due to the biocompatible nature of the lens. 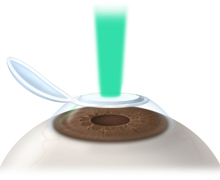 Photorefractive keratectomy (PRK) is a unique laser vision correction procedure that uses an excimer laser to sculpt away a small amount (about 5 to 30 percent) of the top of the cornea in order to correct refractive errors. Instead of cutting a flap into the cornea with a blade like the LASIK procedure, this method preserves the strength of the cornea and avoids the risk of perforation and other flap errors commonly associated with the blade method. The PRK procedure also provides the surgeon with greater control over the location and amount of tissue being removed, allowing patients to enjoy a much more accurate treatment. The PRK method involves gently sculpting the cornea rather than cutting, allowing your surgeon to treat greater degrees of nearsightedness, as well as farsightedness and astigmatism. Up to 95 percent of patients with a correction of up to -6.00 diopters achieved vision of 20/40 or better after PRK, with up to 70 percent achieving 20/20. During cataract surgery, a focusing lens is routinely placed inside the eye. There are a few types of lens implants that can be used. Standard lens implants gives us good vision, but it gives us a limited range of vision. Usually this results in fairly good distance vision without glasses, but 96 % of patients still require glasses mostly to read. The ReSTOR® lens implant is an upgraded lens that works in a way similarly to a built-in progressive lens. It gives us a broader range of vision so that 80% of patients see well enough to read and to see at distance without glasses. The ReSTOR® lens implant decreases our dependence on glasses. Dr. Chopra and Dr. Benedict were among the first doctors in the county to be certified to place this advanced technology lens. If you have a cataract, ask our staff if you are a good candidate for this lifestyle lens. You may never purchase another pair of glasses! To learn more about our Refractive Correction Procedures or to make an appointment with us, please call 770-419-1393.